Twilight Princess was a critical and commercial success upon its 2006 release. Particularly praised was the Wii version, which showcased the capabilities of the console’s motion controls. When you swung the remote, Link would attack with his sword in response. As he drew his bow, you had him shoot arrows by pointing the remote at the screen like a light gun. However, because Twilight Princess was not intended to be a launch title for the Wii, certain critics accused the developers of tacking on the motion controls at the last minute in an attempt to generate interest for the new console. Eiji Aonuma later admitted he and his team didn’t fully realize their goals when they created Twilight Princess. Therefore, they sought to create a sequel, using their previous work as a base. Development for this proposed sequel started in 2006 shortly after the release of Twilight Princess. Mr. Aonuma served as its producer while Hidemaro Fujibayashi, whose first experience working on the series involved directing Oracle of Seasons and Oracle of Ages on the Game Boy Color, found himself helming the project. To put this in perspective, the Zelda franchise was no stranger to critical acclaim. Every single one of its 3D installments by this point had been considered among the greatest games ever made. The follow-up to this already impressive legacy was to be Mr. Fujibayashi’s first project for a home console game. He started work on this game upon completing Phantom Hourglass, concurrently contributing to the latter’s own sequel, Spirit Tracks. Wishing to focus entirely on this new project as soon as possible, the release date of Spirit Tracks was shifted to the end of 2009 from its initial projected launch in early 2010. Once Spirit Tracks was released, he and the rest of the team were transferred back to this project, dedicating their full attention to its completion. A vocal minority considered Twilight Princess the game The Wind Waker should have been from the beginning with its grittier tone and darker themes. It was therefore quite a shock to those same fans when Nintendo showed gameplay footage the following year in 2010. Upon being unveiled in 2009, it was implied the game would feature a dark art style similar to that of Twilight Princess. The footage of this new game implied otherwise; it was a window into a bright, colorful, cel-shaded world. It could be described as a fusion of the cartoonish look that defined The Wind Waker and the more realistic character models Twilight Princess boasted. As it would turn out, there was a practical reason for brightening things up. How enemies held their weapons was to play an integral role in gameplay – having dark graphics would make it nearly impossible to properly gauge one’s situation. The gaming community at large waited with baited breath for this new title. Jerry Holkins and Mike Krahulik, better known as the artists behind the webcomic, Penny Arcade, created a five-part online comic. Robin Williams, a famous actor and comedian who was known for his love for the series, starred in various television commercials promoting the game. The advertisements even featured his daughter Zelda, whom he did indeed name after the title character. 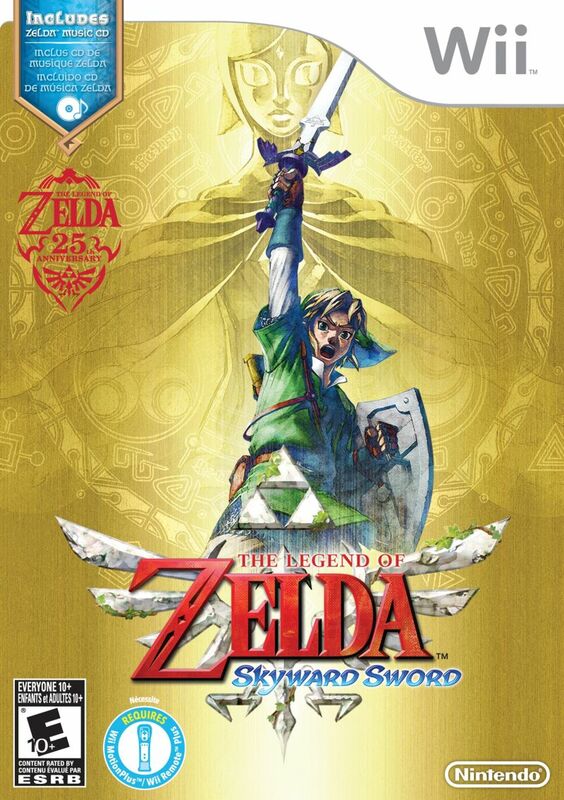 The game, ultimately named The Legend of Zelda: Skyward Sword, was released worldwide for the Nintendo Wii in November of 2011 in celebration of the franchise’s twenty-fifth anniversary. True to form, the game proceeded to amass critical acclaim from nearly every major gaming publication. The 2000s saw Nintendo’s venerable franchise at its most prolific with eight releases in the span of the decade – nine if one were to include the multiplayer-only Four Swords. On top of that, the gaming scene looked quite a bit different than it did even just five years ago. AAA developers were adapting wildly different sensibilities from the ones Nintendo continued to use, churning out experiences that came across as lesser Hollywood productions. Because of this, a big-name company refusing to go along with that trend only to continue winning over critics is no mean feat. Was Skyward Sword truly able to demonstrate the franchise’s continued relevance going into the 2010s? WARNING: There will be unmarked spoilers throughout this review. In the distant past, the goddess Hylia, the one sworn to protect the Triforce, saved the world from a powerful evil. As she fought on the world’s surface, she sent the race of her people – the Hylians – above the clouds. With the remaining races of the world, the goddess fought a fierce battle against the forces of darkness. She proved victorious, sealing the evil power away for eternity. This legend has since been passed down through the generations of the Hylians who formed a civilization in the skies – Skyloft. Many centuries have passed since that fateful battle. A resident from Skyloft, a young man named Link, has a strange dream in which he sees a gigantic, dark beast and a mysterious spirit. The dream comes to an abrupt end when he is awoken by a Loftwing. These giant, majestic birds have been used by the people of Skyloft to navigate the skies. As per the village’s tradition, every single citizen of the village has their own Loftwing. The ability to ride one is what separates children from adults. The Loftwing responsible for Link’s awakening belongs to his childhood friend Zelda. Once roused from his slumber, the bird gives him a message from Zelda. She wants to meet with him at the Statue of the Goddess in preparation for the annual Wing Ceremony slated to take place that day. Link is a skilled member of the Knight Academy. Every student’s goal is to become one of the Knights of Skyloft – protectors of the people who reside in the sky. The ceremony is actually a competition that will determine who will be promoted to the highly desired senior rank. Link setting out to meet Zelda allows you to become accustomed to the controls. 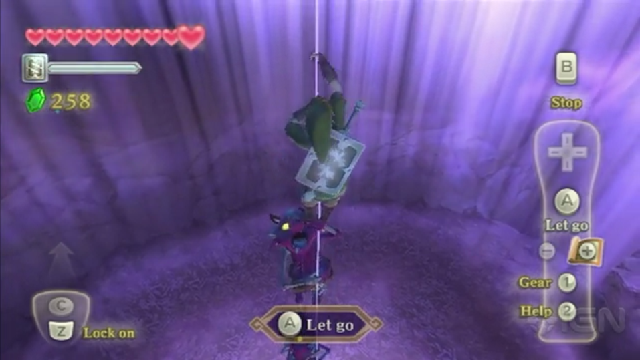 Like Twilight Princess before it, Skyward Sword requires the Nunchaku attachment. Link is controlled using the control stick on the Nunchaku. 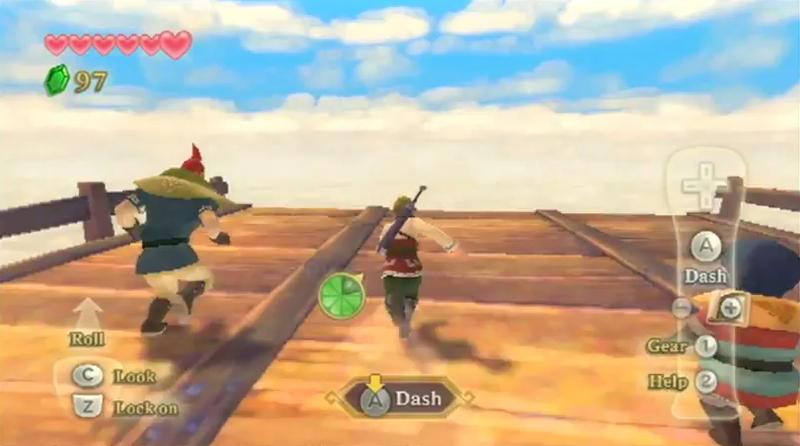 Historically, Link required an item, such as the Pegasus Boots, to gain the ability to run. Such is not the case with Skyward Sword, in which he can do so from the onset. In a manner similar to a 2D Mario title, holding down the “A” button on the remote allows Link to run. However, unlike Mario or his future incarnations, he cannot keep up that pace indefinitely. This is when you’re introduced to the first new mechanic of Skyward Sword: the stamina meter. The meter in question is depicted as a green, pie-shaped indicator and appears when Link runs. The stamina meter also appears whenever Link preforms any other strenuous activity such as climbing, rolling, or manipulating large objects. You would do well to manage it carefully, for if it is depleted entirely, Link’s movements will be hampered considerably until he catches his breath. This situation is especially undesirable if he is in the middle of climbing, for such a situation would cause him to let go of whatever surface he is latching on to. The stamina gauge can be restored if Link happens upon a green fruit. They are expended as soon as Link picks them up, so knowing when to do so is vital to maintaining the meter. Meeting Zelda on the isle on which the Statue of the Goddess rests, he discovers his own Loftwing has gone missing. Groose, Link’s arrogant classmate, has attempted to ruin Link’s chances of winning by kidnapping the latter’s Loftwing. This effort proves meaningless when the officials agree to delay the ceremony so Link may find his bird. He envisions his Loftwing sealed in a small cave on the island’s underside. A massive amount of overgrowth blocks the cave’s entrance, necessitating that he finds a tool capable of cutting it down. Eagus, a knight who trains fresh recruits, agrees to lend him a practice sword. As he teaches you the basic attacks, you learn just how much of a step up the motion controls are from Twilight Princess. Being one of the Wii’s launch titles, the motions for swinging the sword were fairly basic. You swing the remote and Link would follow the direction. 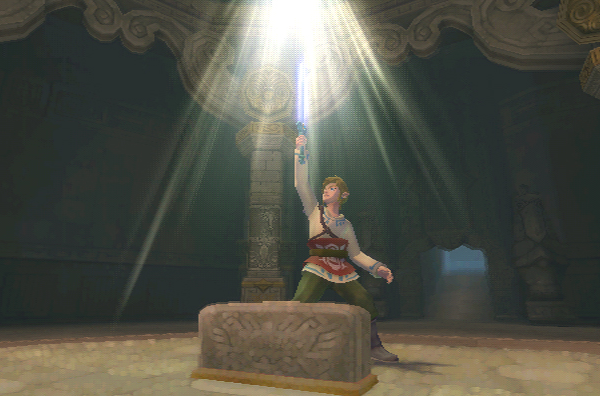 Owing to the Wii MotionPlus, Link holds his sword in a fashion that mirrors your own stance. This game stresses the importance of the direction of each individual slash. This is emphasized in the training sessions wherein the logs you’re made to cut need to be done so in very specific ways. The direction of your slashes needs to match the log’s weakness. If you flail around randomly, you will only succeed in wasting your energy. With a sword in hand, Link sets out to the cave. He liberates his Loftwing from captivity and returns to the Statue of the Goddess to begin the Wing Ceremony. This particular one is quite important to the academy, as it happens to mark its twenty-fifth anniversary. The ceremony involves testing the students’ bird-riding skills. Link faces off against Groose and his two lackeys, Cawlin, and Strich. The rules of the competition are simple: to win, one must take a Bird Statuette off a yellow Loftwing. Because the story needs Link to win this competition in order to proceed, you cannot actually lose – no matter how long you take. Instead, the real purpose of the ceremony is so you may become accustomed to flying the Loftwing. Tilting the remote steers the bird’s flight path while shaking it causes it to flap its wings, gaining altitude. Pressing the “A” button causes the bird to charge forward. 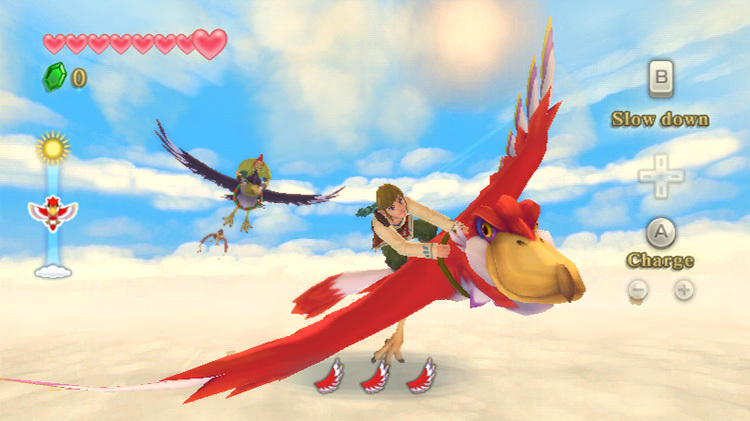 In a manner not unlike riding Epona, the Loftwing can only charge three times before exhausting its stamina. The meter is measured as three feathers. It slowly recovers on its own, though if you completely drain it, you must wait for the meter to refill completely before you can use that ability again. Lastly, the “B” button causes the Loftwing to slow down while pressing down on the direction pad allows it to perform a dive. Excited about his victory, Link meets Zelda atop the goddess statue and receives a Sailcloth from her. They then embark on a flight together. Disaster strikes when a giant tornado suddenly manifests, casting Link and Zelda off their Loftwings. Zelda plummets to the land below and Link is knocked unconscious. In a dream, he sees a mysterious, blue figure and his parting with Zelda. He wakes up to see Headmaster Gaepora standing in his room. Informing the headmaster of Zelda’s plight, he is left to rest until morning when they will begin searching for her. As Gaepora leaves, Link hears a mysterious sound. Emerging from his room, he is astonished to find the same blue figure he saw in his dream. Following it to the Isle of the Goddess, it opens a doorway leading to a hidden chamber within the statue. The figure introduces herself as Fi. She is a spirit that resides within the Goddess Sword enshrined there. Fi tells Link that he is the one chosen by the goddess Hylia herself to complete her task. Drawing the sword from its pedestal, he unleashes a magical energy that activates a crest. The inhabitants of Skyloft have never set foot on the ground, as a thick cloud cover prevents them from reaching it. By activating the crest, Link has punctured a hole in the barrier, allowing him to pass through it and explore the surface world. In preparation for this momentous task, Link is given a knight’s uniform. He takes to the skies, not knowing that through his actions, he has cracked open the door of fate. It is through describing the prologue that I’m sure some people have already caught on to a rather noticeable flaw. The time it takes from entering a name in the file select screen and the moment when the game can be said to have begun in earnest is roughly ninety minutes, which is assuming you’re not mashing the “A” button to speed up dialogue. The prologue of Twilight Princess had some pacing issues, but the creators behind that game at least had the courtesy to pepper it with plenty of action sequences to break up the monotony. To be fair, Skyward Sword did have a swath of new mechanics to introduce as evidenced by the above rundown. Then again, Phantom Hourglass found itself in a similar situation and it opted for a much more laconic method of teaching players the mechanics. It could be justifiable in how Skyward Sword is a more story-driven experience than Phantom Hourglass and all of the relevant players are made known during this time, allowing them to start their individual arcs. Though it does successfully signpost exactly what the players are in for, it nonetheless makes conducting a second playthrough quite tedious. It feels as though the designers ran down a list of the game’s mechanics and made sure to introduce the player to each one before the first act could begin. It probably would have been more prudent to spread out the tutorials. Once the player does reach the first act, however, they’ll soon learn the developers put quite a bit of thought into the gameplay. Before Link sets out on his journey, Fi recommends buying healing potions and a shield. Fortunately for him, the good people of Skyloft run a bazaar in the center of town where Link can buy many useful supplies. Running the Gear Shop is Rupin. He sells various items such as shield and ammunition for the weapons you’ll find. The Scrap Shop, run by Gondo, can upgrade Link’s weapons for him. A married couple, Luv and Bertie are the proprietors of a Potion Shop. Luv brews them while Bertie runs a side business in which he enhances them. If you are unsure what to do next, you can have Link visit the fortune teller Sparrot. Lastly, Peatrice has been left in charge of the Item Check, which allows Link to store his belongings. Ever since A Link to the Past, Rupees have had a decidedly negligible value. The plot would occasionally mandate that players purchase an expensive item to progress, but after that point, they would sit on a large pile of Rupees with nothing to spend them on. In some games such as Ocarina of Time and Majora’s Mask, there were many places that spawned an infinite number of them. You didn’t even have to go out of your way to discover these caches. This meant there was no reason to ever save money. Link could easily afford any item no matter how high the number on the price tag was. The only catch is that he may have needed a wallet upgrade to fund the more extravagant purchases. In Skyward Sword, you’ll learn soon enough that Rupees are far more valuable than ever before. This goes far beyond using them to power a pair of magic armor. Whether you’re upgrading your equipment or buying potions, you will always have at least one item or service for which you’re saving money. It’s to the point where those attempting to complete every sidequest will rarely, if ever, fill Link’s wallet to its capacity. Furthermore, many of these upgrades require materials in addition to Rupees to obtain. These materials come in various forms such as insects, alloys, or animal remains. Insects tend to spawn in fixed locations and can be caught with a butterfly net. Other materials can be won in contests or found in treasure chests. 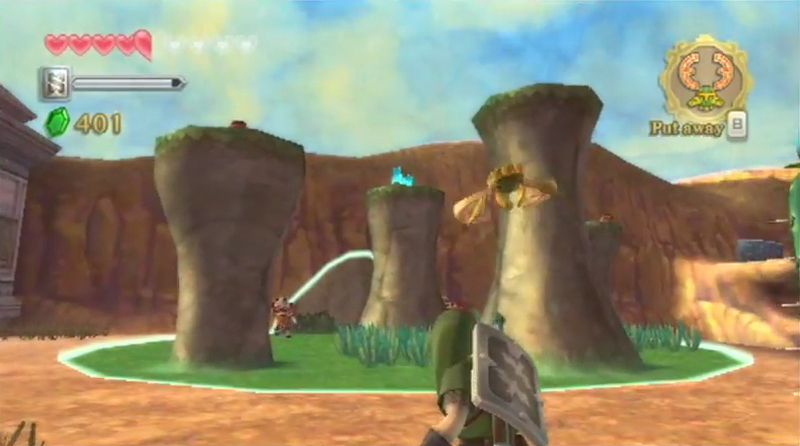 Skyward Sword features two separate inventory screens. One is accessed by holding down the “B” button. This is where Link’s equipment is stored. He can only have one item equipped at a given time. The equipped item is then readied by tapping the “B” button. By holding the “-” button down, you can access Link’s pouch. Some of the first items you’ll obtain that can be stored in the pouch are shields and the bottles in which potions are stored. Later on in the game, you may discover medals that confer a passive bonus onto Link when placed in the pouch. The effects of these medals vary wildly from extending the duration of a potion’s effects to causing more hearts to spawn upon slaying an enemy. The pouch can hold four items at first – fully upgraded, its capacity is eight. Appropriately, with the Wii Remote acting as a physical manifestation of Link’s sword, the Nunchaku is one for his shield. 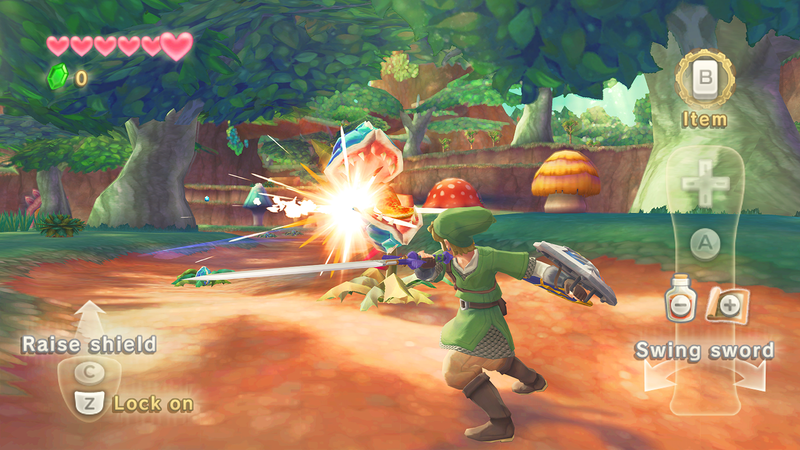 Shaking the Nunchaku causes Link to raise his shield. Holding it up front as though it were a real shield causes Link to mimic your actions. When it comes to the shield’s usage, Skyward Sword dispenses with another series tradition. In 2D installments, you could expect the shield to stand up to any projectile once fully upgraded. In 3D installments they gained the ability to withstand melee attacks as well. With the odd exception here and there, you could evade the brunt of an enemy’s attack simply by holding the designated shield button. As soon as you get your first shield in Skyward Sword, you will notice something resembling a meter next to its icon. This means exactly what you’re thinking – shields in Skyward Sword have limited durability. Blocking attacks with the shield will steadily damage it. You can avoid damaging the shield if you swing it the exact moment an attack makes contact. Should your shield take damage, you can either bring it back to Gondo and have it repaired or use a Revitalizing Potion on it. While the latter method is more convenient, having Gondo repair it for you is cheaper. It’s best to err on the side of caution when debating how to solve this problem because the shield shatters when its meter is completely drained, rendering it irreparable. Yet again, I applaud the developers for their innovation. To celebrate the franchise’s twenty-fifth anniversary, they clearly went the extra mile to deliver as rich of an experience as possible. Before its release in 2011, longtime fans were skeptical upon hearing rumors that the game was going to be made easier. They were quick to point out that the franchise hadn’t issued a truly challenging installment since the NES era. Taking a look at Link’s meter would only seem to reinforce this perception. After all, in every game in the series thus far, Link began with three hearts, not six. However, when you begin fighting monsters, you’ll realize that a majority of enemy attacks take away a whole heart – sometimes two. Only the absolute weakest enemies will take away half of a heart or less upon successfully striking Link. The implications of this subtle change are clear: Skyward Sword is markedly more challenging than any of its 3D predecessors. Suddenly, the players who forewent locating all of the Heart Pieces in favor of finishing the game as quickly as possible will realize they can’t afford to let even a single one slip through the cracks. This shift isn’t just evident in the amount of damage enemies inflict. Attempting to combat them without a strategy more advanced than “hit them until they fall over” is futile in most cases. One of the first enemies you encounter are Deku Babas – carnivorous plants with mouths that open a certain way. You have to swing the sword in the direction that exploits their jaw’s weakness. 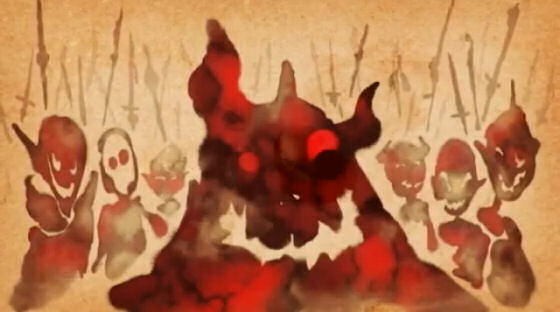 Because many enemies are dispatched using very specific sword slashes, every enemy encounter becomes a small puzzle. Just in case you were entertaining thoughts of calling the developers’ bluff, awaiting you at the end of the first dungeon is the game’s primary antagonist, Ghirahim – the self-styled Demon Lord. He speaks to Link with an unbelievable level of condescension. The worst part about this is that he has the skill to back up his ego. Indeed, if you haven’t become accustomed to the controls by then, he will defeat you – no if, ands, or buts. Holding the sword and striking him in predictable patterns will only result in him taking Link’s weapon away from him. Unlike most Zelda boss fights, you can’t even rely on the item you find in the dungeon to help you defeat him in any way; this is a test of raw skill. Because you also have no chance to upgrade Link’s life meter beforehand, you’ll realize you can’t afford to make too many mistakes. You either rise to the challenge or risk getting left behind in the dust. Even the weakest Zelda installments have delivered when it comes to boss fights, and as Ghirahim demonstrates, Skyward Sword is no exception. Naturally, no assessment of a Zelda game would be complete without commenting on its level design. It’s appropriate that Hidemaro Fujibayashi found himself in the director’s chair for Skyward Sword because, having previously assisted Daiki Iwamoto with the development of Phantom Hourglass, both games have similar approaches to overworld exploration. 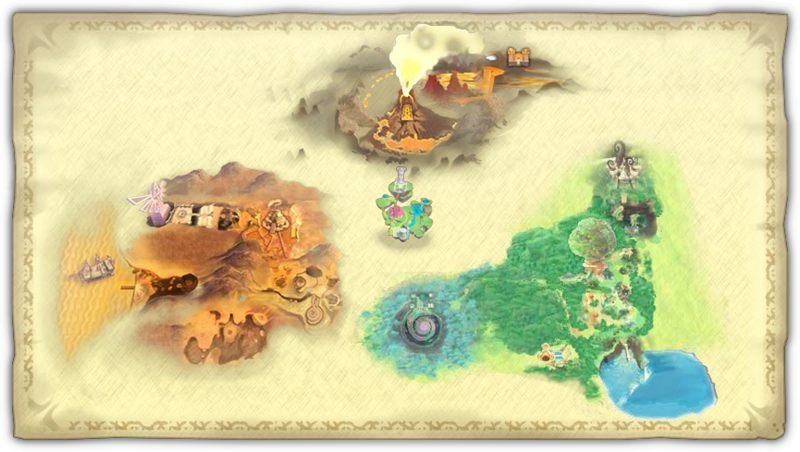 The surface world is divided into three regions: the Faron Woods, the Eldin Volcano, and the Lanayru Desert. The sky acts as a hub of sorts, allowing access to each of these three regions. Similar to how the Phantom Hourglass incarnation of Link needed a Sea Chart to access different regions of the Ocean King’s Realm, this game requires the hero to assemble a tablet to break through the Cloud Barrier and explore the surface world in full. As such, one could argue that Skyward Sword doesn’t have a singular overworld. One notable difference between Phantom Hourglass and Skyward Sword is that there is no analogue to the Temple of the Ocean King. Even if Spirit Tracks proved such a concept could work, this is for the best. Instead, each region is home to two dungeons apiece. Part of what made Phantom Hourglass disappointing was that the four sections of the Ocean King’s Realm didn’t have much of an identity to them. By making players spend a significant amount of time in each reason and interact with the denizens, there is plenty of opportunity for the world to build itself. 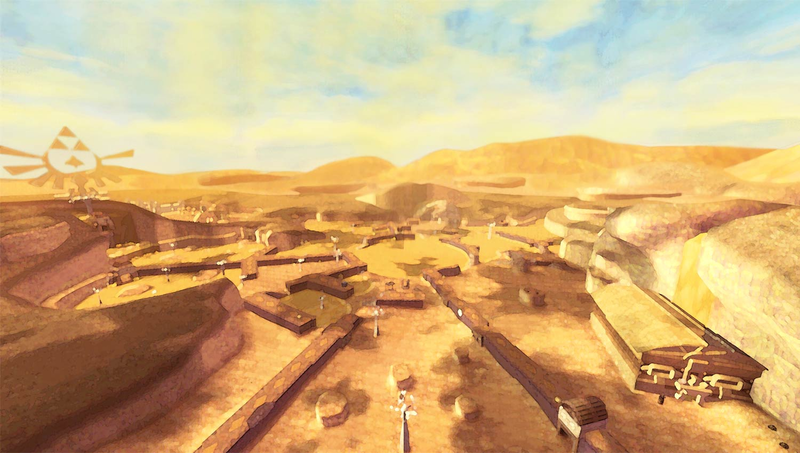 Between the game’s three regions, the Lanayru Desert stands out as a particularly brilliant stroke of genius. This wasteland was once inhabited by ancient robots. They performed tasks for the people living in the region and unified with Hylia against the ancient evil. After she relocated her people to the skies, they fell into disrepair. The arable land too fell into a state of decay, leaving a sprawling wasteland in its wake. In its current state, much of the region cannot be traversed by conventional means. All hope is not lost, for scattered throughout the desert are curious crystalline objects known as Timeshift Stones. Once struck, they cause a temporal shift in an enclosed, circular area, allowing the exact spot to appear as it did hundreds of years ago. Robots can be interacted with, broken machines are restored, mine carts become operational once more, and the barbed wire covering certain doorways disappears. Only one can be activated at a time, so you must think carefully on how to utilize them. Things get particularly interesting when you begin encountering mobile Timeshift stones. Some are placed in mine carts, allowing the temporal field to move along the tracks. There are even smaller, spherical stones that Link can carry with him and throw with the field continuing to encompass the immediate area. I could easily envision somebody making a puzzle game not unlike Portal revolving entirely around these Timeshift Stones – that is how much respect I have for this mechanic. Between Ocarina of Time and Oracle of Ages, time travel had been a reoccurring element in the franchise, but this development takes the concept to a whole new level. Though the Lanayru Desert is my favorite region of Skyward Sword, the one dungeon that stands out the most to me is in a lake in Faron Woods. Water-themed dungeons have always been something of a point of contention in the Zelda fandom – especially after the series made the 3D leap in 1998 with Ocarina of Time. The Water Temple, Great Bay Temple, and Lakebed Temple are popularly considered the worst dungeons of their respective games. With the possible exception of the Water Temple, I found I didn’t really understand why these dungeons were so reviled. I never found navigating the underwater portions to be overly difficult. The reason I say this is because Skyward Sword, with its own water-themed dungeon, the Ancient Cistern, managed to achieve the impossible – it managed to win over nearly every single one of those detractors. I can certainly see why it’s such a popular dungeon because from a thematic standpoint, it is very clever. It is divided into two floors. The ground floor is serene and brightly-lit and the statues bear a clear Buddhist theme to them. When you get the basement floor, however, you’ll feel as though you stepped into Hades itself. The corrupted water damages Link if he sets foot in it, and the area is populated by zombie-like monsters. This culminates in a surprisingly tense sequence in which Link must climb up a rope to the ground floor with monsters following suit in an attempt to drag him back down. This is likely a reference to The Spider’s Thread, a classic short story written in 1918 by Ryūnosuke Akutagawa. |In it, the Lord Buddha gazes into a pond and into the depths of Hell. He notices a criminal named Kandata who, despite his moral failings, avoided crushing a spider. Feeling Kandata was not beyond redemption Buddha lowers a spider thread into Hell, allowing the criminal to enter paradise. Other sinners begin climbing the thread as well, causing Kandata to proclaim the chance to escape Hell is his alone. It is at this exact moment the thread breaks – Kandata selfishly worrying about his own salvation cost him his chance to redeem himself. This reflects in the game as well; the only chance Link has to escape the dreary underground of the Ancient Cistern is to keep climbing and not worry about fending off the monsters pursuing him.| Consciously or not, works of fiction tend to reflect the culture the land that produced it, and this sequence was an excellent way for the creators to share a little bit of their background with their international fans. As for the rest of the game, I would say Skyward Sword is very similar to Phantom Hourglass and Spirit Tracks in that it has a fairly limited array of items, yet you’re always finding new uses for them. You find a mechanic object called a Beetle in the first dungeon, which is capable of flying autonomously. With it, you can scout the area ahead, strike switches, and cut ropes or vines. It remains useful throughout the entire game – even gaining the ability to carry objects later on. This approach allows the puzzle solving aspect to build off of itself. In this regard, Skyward Sword could be said to be an improvement over Twilight Princess in which certain items seldom saw any use outside of their debut dungeons. This time, the game requires puzzle solving skills more advanced than simply using the dungeon items on the clearly marked hotspots until you drum up the solution by accident. Unfortunately, as inventive as Skyward Sword is, the reality is that, it suffers from quite a few execution issues. One curious facet of Twilight Princess was that it gave Link two ranged weapons: the slingshot and the bow. In Ocarina of Time, the latter weapon could only be used by Link as a child whereas the latter required him to reach adulthood to utilize. However, in Twilight Princess, the young adult Link could use both. As the bow, being able to fire arrows rather than seeds, is the superior weapon, the slingshot became borderline worthless once Link obtained it. In Skyward Sword, you will be using the slingshot for a significant portion of the experience because the bow happens to be in the fifth dungeon – and there are seven total. Because of this, the slingshot is less redundant than its counterpart in Twilight Princess, but mostly because the bow is withheld from you for an anomalously long time for no real reason. I can appreciate giving every item a defined purpose that runs throughout the entire game, but this was a case of the developers creating a new problem by attempting to resolve an issue nobody really had. One of the bigger complaints I have with the game is that the world design feels very disconnected. This is because it’s not possible to travel between regions on the surface. In order to visit a different one, you must return to the sky and ride the Loftwing to the appropriate drop-off point. Admittedly, it is somewhat forgivable because technical limitations made the ability to travel between regions impossible. By the end of the project, the developers encountered memory issues due to having pushed the single-layer limit of the Wii Optical Disc to its brink. 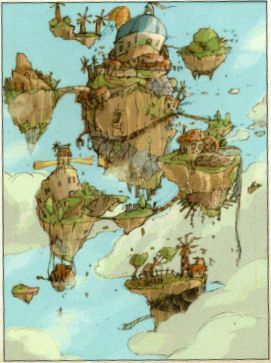 This caused Skyloft, which was depicted as a rather large city in early concept art, to appear as a small hamlet in the final product. Nonetheless, it is quite irritating having to fly the Loftwing all the way across the sky to another hole in the Cloud Barrier just to switch regions. Then again, it’s almost for the best that the Loftwing is required to do this because if it wasn’t, you would barely have any use for it at all. When I played Skyward Sword for the first time, I was convinced there would be several minigames akin to the Wing Ceremony that tested your mastery over the Loftwing. As it stands, the Loftwing is used for navigating the sky and almost nothing else. Link does get to ride it during a boss fight nearing the end of the game, but it’s disappointing that it doesn’t play a larger role – especially given how important they are to the culture of his community. Even taking the need to fly across the sky to access different regions out of the equation, I still have to say that one of the most insufferable aspects of Skyward Sword concerns its backtracking. An unintended consequence to keeping the regions separated is that they all come across as extensions of the dungeons themselves. As a result, walking from Point A and Point B is often easier said than done. There is a generous amount of shortcuts available in each region, and it’s possible to use Bird Statues, which function as save points, as Link’s method of ingress from the sky. It still doesn’t change that by the end, you are going to be running around the same areas of a given region multiple times just to complete the game. This includes navigating obstacles and fighting monsters that ceased being a threat long ago. I actually have quite a few more criticisms for Skyward Sword, but I will need to establish the proper context in order for them to make any sense. It’s just as well – even the handheld Zelda games have had surprisingly ambitious narratives, so failing to acknowledge the narrative of this installment wouldn’t do the experience justice. Though I can say many great things about the narrative, the hard truth is that it’s just as hit-or-miss as the gameplay. To backpedal from this assertion slightly, I will admit the main characters are, for the most part, likable. Despite not having any lines, Link has quite a bit of character to him – which becomes evident when observing the various reactions he has to the story’s myriad bizarre developments. He even manages to go through an interesting arc. By the end of the game, you’ll find it hard to believe that Zelda ever called him lazy when he proves more than capable of fighting entire hordes of demons singlehandedly. Skyward Sword continues the time-honored tradition of the writers experimenting with the series’ conventions. A character named Zelda has played a prominent role in a majority of these games. Even the odd exceptions such as Link’s Awakening and Majora’s Mask briefly mention her, cementing these characters’ importance to the canon. 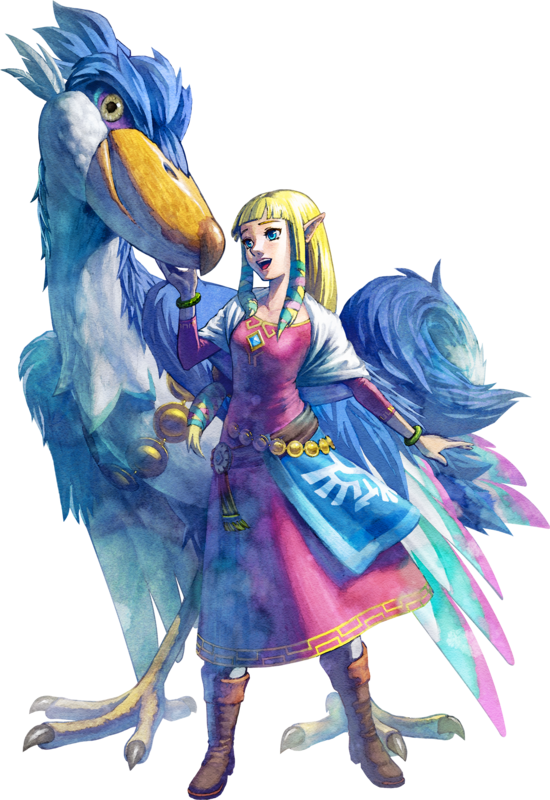 Make no mistake, she is a vital character in Skyward Sword as well, but the game throws a twist regarding her character as soon as it begins. This incarnation of Zelda isn’t a princess; she’s simply Link’s childhood friend. Interestingly, this personal incentive can make players even more motivated to reunite her with Link. I say “reunite” rather than “save” because the plot doesn’t really focus on rescuing her. Instead, the narrative primarily features Link attempting to stop the ancient evil Hylia sealed away from dominating the world. Despite this, the conflict is every bit as engaging here as it was in the installments leading up to it – possibly more so given the presence of Ghirahim. Adding insult to injury is that it’s clear in the first boss fight he’s merely toying with Link. 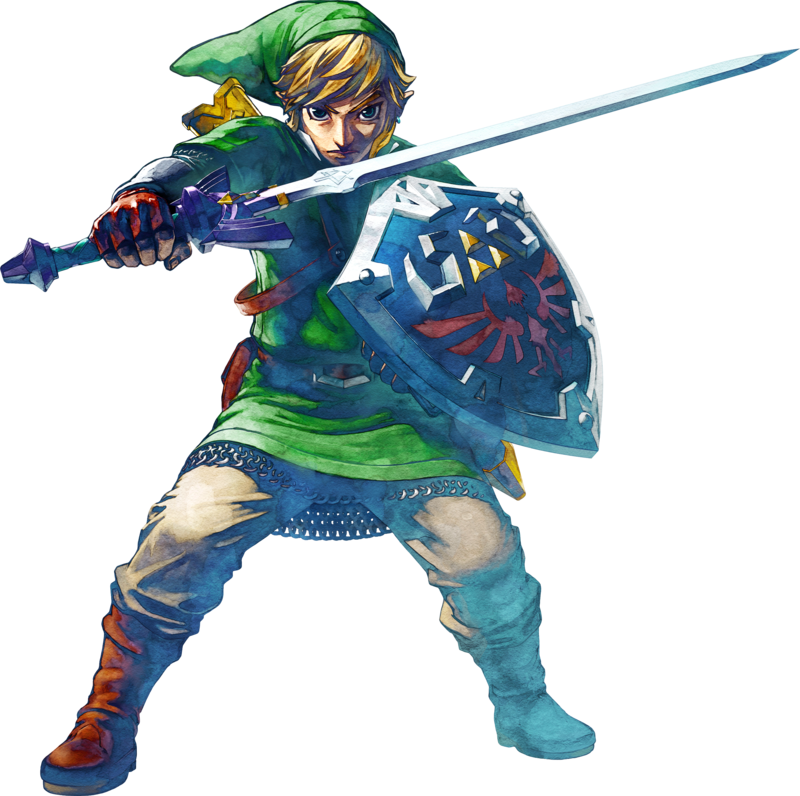 With his ability to appear in various places and taunt Link, he fulfills a rival role the series hadn’t consistently employed. Throughout the game, you will be wondering exactly what his overarching goal is and how Zelda factors into all of this. Anyone who has played this game knows that it would be remiss of me to parse the narrative without mentioning Groose. When the game begins, he’s nothing more than an egotist driven by jealousy. He has always had a crush on Zelda and doesn’t understand what she sees in the quiet Link. That he and his cohorts blatantly cheat during the Wing Ceremony only cements his status as an unlikable bully character. Despite this, Groose is one of the most popular characters in the game. Normally, I would take this as evidence that the fans have no taste, but by the end, he reveals himself to be surprisingly endearing. When Zelda is missing, he falls into a state of depression, blaming Link for what happened. Later, during one of Link’s expeditions to the Sealed Temple on the outskirts of the Faron Woods, Groose follows him to the surface. He is initially frightened by his unfamiliar surroundings, though after Link reassures him, he races ahead to the temple. The old woman who resides there tells Groose that Link is the one destined to aid Zelda and not him. Shortly thereafter, The Imprisoned, the entity sealed by Hylia escapes its confinement. After Link fends off the demon, Groose gains a grudging respect for him. He chooses to stay behind with the old woman, whom he affectionately dubs “Grannie”. Later, when The Imprisoned breaks free again, Groose reveals he had prepared for this possibly by building a weapon he calls the Groosenator. It is a large catapult built on a rail system capable of launching bombs from afar. Using this weapon is instrumental in defeating The Imprisoned in the subsequent fights. I remarked when discussing Spirit Tracks that its central dungeon, the Tower of Spirits, felt like an extended apology for the Temple of the Ocean King. I feel a similar principle applies to Groose. When I played Phantom Hourglass, I heard that Linebeck would redeem himself by the end of the game. Depending on your perspective, his redeeming moment either never happens or is too little, too late. Regardless, it meant you had to put up with his tiresome behavior for the entire game for no satisfying payoff. The reason I bring this up is because I feel Groose goes through the arc the writers should’ve given Linebeck. He starts the game an insufferable dolt, but by the end, it’s clear he’s learned from Link’s heroic example. Unfortunately, though I can say the cast is likable, three major exceptions do an astoundingly good job ruining that goodwill. For fans, the most obvious one is Fi. By the end of the game, you will have a strong opinion of her. Supporters like her for cute design and voice while detractors hate her for pointing out the obvious to a decidedly insulting degree. What doesn’t help is that her counterpart in Twilight Princess, Midna, was an excellently written character and had quite an impressive fanbase. This means any way in which Fi fell short was doomed to stick out like a sore thumb. In this matter, I find the complaints lodged toward her are indicative of a larger problem. Don’t think the game was finished holding your hand when you reached the first act. Throughout the game, Fi will note when Link is severely injured, repeat revelations he just saw, and prevent him from going off the rails for any reason. All of these are wholly unnecessary given that even new players would assume the heart meter depleting is a bad thing, have eyes with which to see these revelations, and are naturally inclined to explore given Skyward Sword is an action-adventure game. There is even one point in which she flat-out spoils the solution to what would’ve been a creative puzzle. While I still say she’s not nearly as annoying as Linebeck and some of her more deadpan lines are admittedly rather amusing, I completely understand where her detractors come from. Personally, I feel Fi is a decent character when she actually gets to be one. Had it been possible to turn off these hints, she would’ve been much more tolerable. As it stands, the writers ended up sabotaging themselves when they attempted to give her a character arc. By the end, it’s clear she was meant to learn what human emotions are, but because more than half of her dialogue is gameplay-related, her arc doesn’t get a chance to shine. We see snippets and vague suggestions of her evolution throughout the game, but they’re not meaningfully connected and therefore highly forgettable. 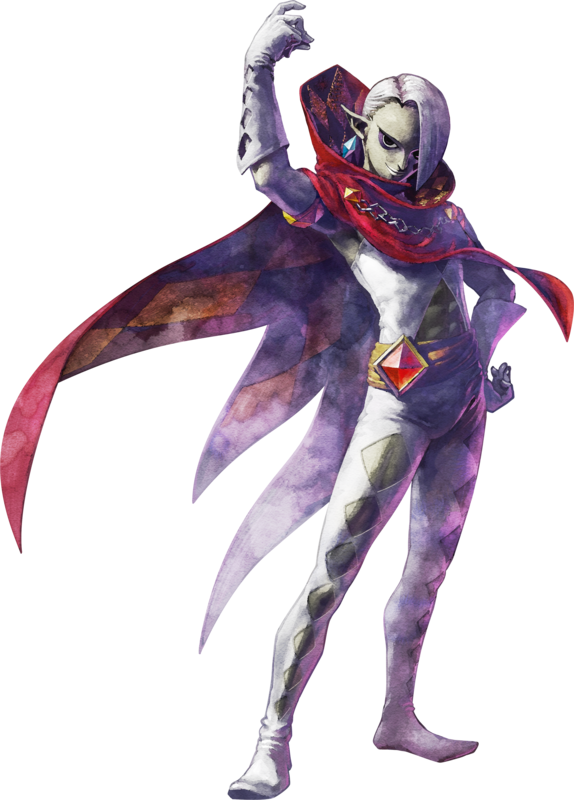 Even so, as bad as Fi can get, she doesn’t hold a candle to the most obnoxious character in the game – that would be Ghirahim. Though I can appreciate having a villain who actively antagonizes Link, the problem is that he is an extraordinarily insufferable character. Despite his annoying personality, he proved to be a popular villain with various lines of his having been quoted incessantly on internet forums. While he may have won over a significant portion of the Zelda fandom, I was not convinced. Part of what ruins his appeal is that he is very much a product of his time. Possibly owing to the success of The Dark Knight in 2008, which included a memorable performance by Heath Ledger as the Joker, writers suddenly latched onto the idea that villains didn’t need actual personalities to be deep; simply being evil and chaotic was good enough. Fans, for their part, seemed to measure a villain’s worth solely in the number of memes they could spawn. While I doubt Ghirahim was inspired by the Joker, it’s difficult to falsify the premise that he benefited from the character’s wake. At the end of the day, his antics are more annoying than humorous, and the experience as a whole suffers for it. Interestingly, the final exception, though not as grating as Ghirahim, is also a symptom of one of this game’s main shortcomings. Later in the game, you learn that three dragons serve as guardians of their respective regions. Such is the extent of their importance that they regions were, in fact, named after them. Link encounters her long before the other two, and her first action is to order Link to revisit the first dungeon to retrieve sacred water. This adds nothing to the experience whatsoever; it would have been much better to place the sacred water in a hitherto unexplored mini-dungeon. She then proceeds to top herself later on when Link is required to visit all three dragons to learn “The Song of the Hero”, one of the steps necessary to obtain the Triforce. When Link returns to the Faron’s domain, he learns the dragon has flooded the entire forest to prevent demons from wreaking havoc. In doing so, she has callously displaced the forest’s inhabitants. 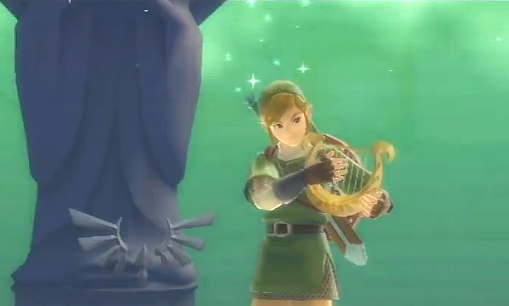 Rather than simply teaching Link the song, she forces him to search the waters for creatures called Tadtones that will, in turn serve as the notes. 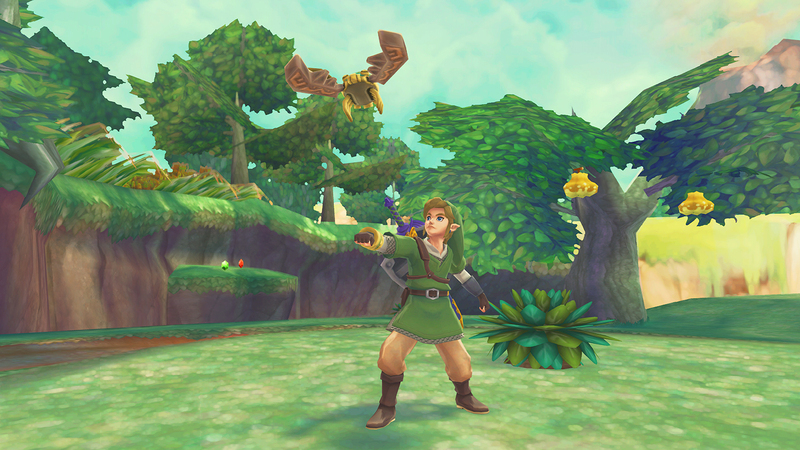 If Link takes too long, they disappear from the score, returning to their original location. While getting the sacred water was at least contextualized reasonably well, the same couldn’t be said of this scenario. Exacerbating matters is that obtaining Eldin’s portion of the song is equally annoying. Returning to the Eldin Volcano reveals it is in the middle of a violent eruption. Upon entering the region, Link is knocked out and all of his items are taken away. It was bad enough having to complete three stealth sections just to enter the second set of dungeons, but then the game decides to compound it with the dreaded gearless stage. I have never been a fan of these kinds of scenarios, and the one in Skyward Sword is no exception. Players spent the entire game learning how to master the controls, gaining new abilities along the way only to be told that none of their past experience applies. By taking away the inventory, the game forces them to adopt a skill they had no reason and no opportunity to develop, leading to an affair fixated on trial-and-error. Lanayru’s is the only scenario that doesn’t come across as filler simply by virtue of allowing players to explore an entirely new section of the game. It’s probably no coincidence that he is by far the most likable of the dragons, having not caused the problem Link has to deal with when attempting to learn the Song of the Hero. Much like how Fi embodies the game’s propensity to hold the player’s hand, Faron’s general attitude is a testament to the unbelieve amount of filler present in Skyward Sword. Though I could agree somewhat when fans said Twilight Princess was bad in this regard, I have no doubt Skyward Sword is worse. This is not only evident in the inane fetch quests, but also the boss fights. By the end of the game, you will have fought both Ghirahim and The Imprisoned three times apiece. The encounters are only slightly more difficult each time, which doesn’t justify wasting the player’s time with them. The final fight against The Imprisoned is especially egregious because it contributes nothing to the story at all. One aspect that proved particularly controversial is the ending. Ghirahim has been working tirelessly to revive Demise, the being sealed away by Hylia. He is actually Demise’s sword, which makes him Fi’s evil counterpart. After a fierce battle, Demise places a curse on Link and his descendants, forcing them to constantly battle the forces of evil. This means that Ganondorf and his various incarnations are actually manifestations of Demise’s hatred. I can certainly see why this didn’t sit well with fans, as it cheapened Ganondorf as a character when he had a surprising amount of nuance to him – especially in The Wind Waker. Surprisingly, I found I didn’t mind this revelation because I thought the ending’s true strength lied in how it serves a prequel to the entire series thus far. Link’s adventure transforms the Goddess Sword into the Master Sword, the weapon his future incarnations will use against Ganondorf. It’s strongly implied that Link and Zelda, now settling on the surface, will form the Kingdom of Hyrule, thus setting the stage for many more adventures across several installments. There may have been several bumps along the way, but this moment was a perfect note on which to end the game. The Legend of Zelda stuck out among its contemporaries in that its installments had a reasonably timeless appeal to them. Even Majora’s Mask, which has noticeably dated graphics by today’s standards, is still Majora’s Mask first and an early-2000s game a distant second. This is true for a majority of the franchise’s canon with installments such as A Link to the Past, Ocarina of Time, The Wind Waker, and Twilight Princess still considered some of the greatest games ever made. The reason I chose to mention this is because I feel Skyward Sword is the first 3D installment I cannot say is timeless. 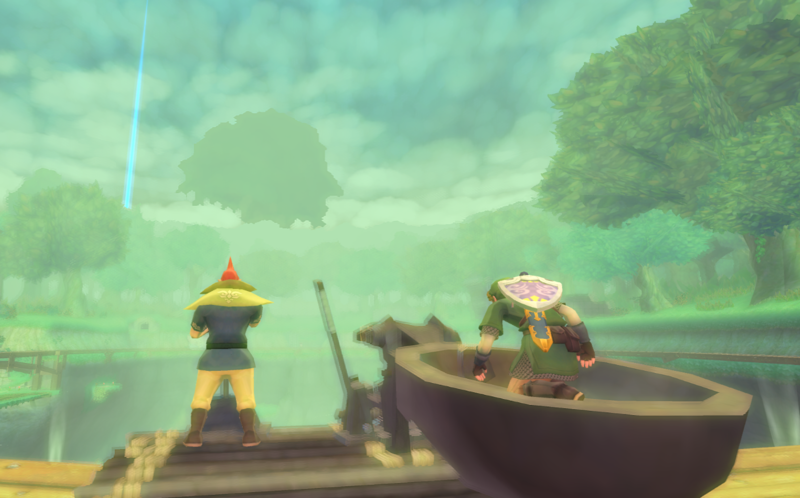 Between its propensity to hold the player’s hand throughout the entire experience – despite paradoxically being the most difficult 3D installment the series had produced by that point – and its villain who more flash than substance, Skyward Sword is a product of its time through and through. For what it’s worth, Eiji Aonuma himself came to regret the sheer amount of hand-holding in this game, so if you find revisiting it to be a hassle, know you’re hardly in short company. More than any other game in the series, I find giving an accurate assessment of Skyward Sword to be incredibly difficult. When this game succeeds, it succeeds on a level many development teams couldn’t even dream of achieving. On the other hand, it’s nearly impossible to play this game for any length of time without running into a glaring mistake one would expect a fledging developer to make. 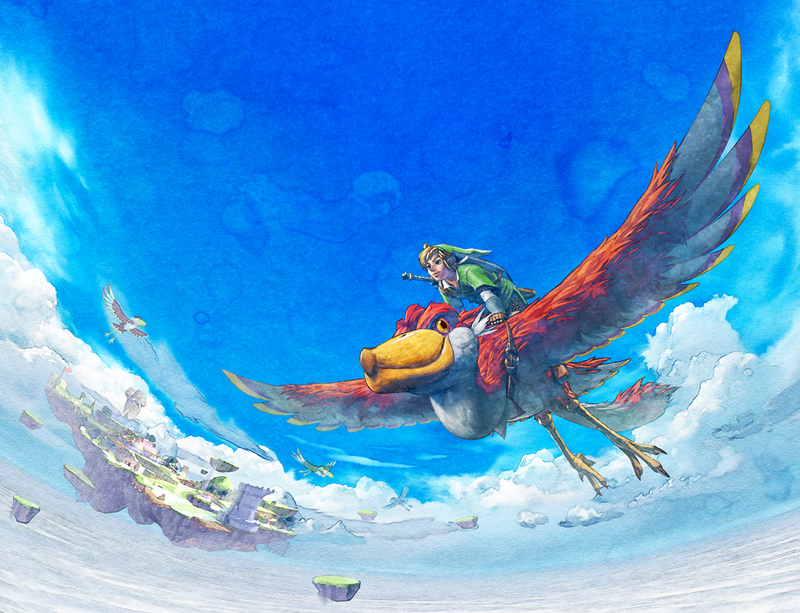 In short, Skyward Sword is a clear example of a phenomenal game lurking in an otherwise middle-of-the-road experience. As such, when it comes to recommending it, I’m slightly torn. I still think after weighing its pros and cons, it manages to be an above-average game overall, but you will have to put up with a lot of aggravation just to experience those flashes of brilliance firsthand. At the end of the day, I would implore fans to go ahead and check Skyward Sword out anyway – just take the overwhelmingly positive praise it received in 2011 with a grain of salt. Everyone else may find it fascinating enough to soldier through, though if you dislike the series, this is not the installment that will change your mind. As Hidemaro Fujibayashi’s first attempt at directing a console game, Skyward Sword wasn’t a bad effort at all. Still, though 2011 may have gone down in history as one of gaming’s best years, I can’t say this was among its stronger titles. I haven’t played a Zelda properly since Wind Waker, but this is one I always liked the look of. Poor beginning and wonky end with a creamy middle is how it sounds to me. That description is dead on. It’s too bad Skyward Sword has such glaring flaws because when it’s good, it’s really good. As I said, if you’re interested in playing it, I’d say go ahead, but you are going to have to put up with a lot in order to appreciate what it does well. That’s always an issue as a grown up with a family, job etc. If something is going to take to long to get into then it’s probably not going to get played. Ain’t got time for that these days! Wind Waker came along at the right time, meaning the stupid Triforce hunt didn’t bother me to much. That’s one of many things I admired about Breath of the Wild – it’s long, but you could pick it up and reach the main game almost immediately. That Triforce hunt really caused the pacing of The Wind Waker to come to a screeching halt, didn’t it? At the time I had heaps of hours to play so I didn’t mind it so much. But in hindsight, it’s a pretty dreadful mechanic! Wind Waker is still one of my favorite Zeldas, but the Triforce quest is always that moment that makes me want to take a break from it. Happens every play through. Still, at least it was one segment. With Skyward Sword, the second half of the game has a similar pacing issue. I may not have a family, but even with my priorities and such, it’s hard to commit to really long games these days. Persona 5 for example, was great from what I’ve played, but I kind of dread going back to it because it’s supposedly 100+ hours. Geez! I know what you mean. When I did a second playthrough of The Wind Waker, I gave up at the Triforce hunting segment because I didn’t want to go through that again. 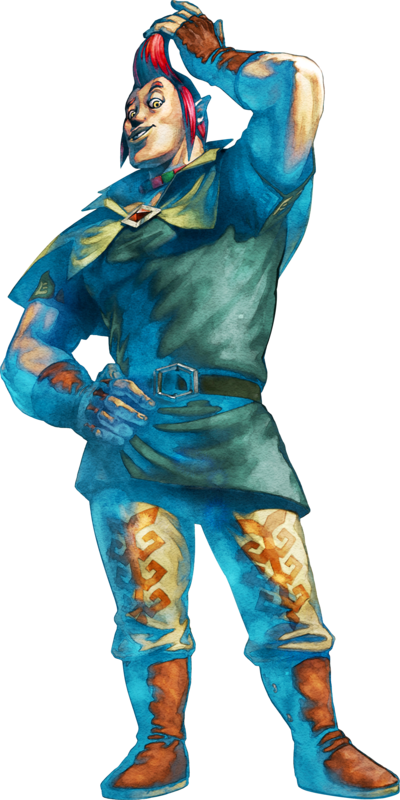 That said, I do like it better than learning the Song of the Hero in Skyward Sword if for no other reason than because it’s contextualized better. With Skyward Sword, it’s like “Hope you enjoy swimming and timed fetch quests!” and “Enjoy using your gear? Too bad! We’re taking it away!” It may not involve Tingle, but the last act somehow manages to be ten times as obnoxious. The final dungeon is fine, but hardly worth having to put up with that. I did manage to complete the one-hundred hour long Dragon Quest VII, but was a portable game, making completing it relatively easy. Otherwise yeah, I get a sense of dread whenever companies brag about their games being 50+ hours long because I know a fair chunk of it will be filler. I’m in the minority who liked Wind Waker and Majora’s Mask best of the 3D Zeldas until Breath of the Wild arrived. I still think Wind Waker is probably the best thing to ever happen to video game graphics (with the possible exception of Yoshi’s Island). A lot of people give flack to the motion controls of Skyward Sword, but those were great. It was the dreadful pacing that held it back. Long games were fine back when they weren’t so common. But now it’s just about every game on the market! If I put 100+ hours into a game, I want it to be by choice over a long period of time (like playing with friends in Overwatch or all that time I spent making stages in Super Mario Maker), I don’t want to play a game where I HAVE to put in that many hours into a game. I mean, people consider 20 hour games short these days. If you deprived yourself a few hours of sleep and dedicated a whole day just to that game, that game is your whole day. How is that short? I think 20-30ish hours is what I want from a really big game these days. Though I always welcome the 10 hour and under experience for anything else. Great review! I overall enjoyed Skyward Sword despite its flaws. But if I ever have to fight the Imprisoned again, I think I might scream, haha. I certainly think it’s an above-average game despite itself, but its flaws weigh down the experience to an absurd degree; overlooking them is something I could not do. Also, The Imprisoned could be the single worst boss fight in the series; even the Groosenator couldn’t save it. I agree with that! I also played Hyrule Warriors and the Imprisoned popped up several times in that game too. I’ve seen more than enough of that damn thing, haha. I will read it thoroughly later, but I am glad to see you pointed out motion controls as one of the game’s highlights. I have read many takes on the game that were negative towards it because of the controls, but I feel they are mostly excellent. If future Zelda games gave us the chance to choose between buttons and a control scheme that is similar to that of SS, I would definitely go for the latter, especially because of the sword. It is, however, easily the weakest of the 3-D Zelda installments, despite the fact it has excellent dungeons. I was especially disappointed with the sky, which feel awfully underdeveloped. The only one of the backtracking sections I dislike massively is the one that takes place in the woods. I actually like the gearless segment and, as you mentioned, revisiting the desert is awesome for how it uncovers what is pretty much an entire new region. Of all the possible complaints one could have for this game, the motion controls shouldn’t have been among them; they were by far the best part. I would say it’s my second-least favorite 3D Zelda game after Phantom Hourglass, though if we’re only counting 3D console games, it is easily the weakest one. When it comes to gearless levels, I can only think of one game that managed to do it well, and that was Metal Gear Solid 3. This is because one didn’t significantly have to change one’s tactics for that segment. You have to be stealthy, but that had been true for the entire experience leading up to that point – it’s just slightly more difficult, which is fine given how late in the game it occurs. Otherwise, it’s just annoying. It especially doesn’t work in Skyward Sword or any other game with that much emphasis on action. A lot of people criticize the Forsaken Fortress for doing that so early, but Skyward Sword demonstrates that it doesn’t work out any better placing it near the end. It’s a shame because if those issues were removed, Skyward Sword would have a rightful claim as one of the greatest games ever made. As it stands, it’s merely decent with a few flashes of brilliance. Oh yeah, I meant the weakest among the 3-D console games. So we agree on that one. Oh, and the Ancient Cistern is indeed utterly brilliant. I loved it, but do need to revisit the son of a gun for a reappraisal. Can’t believe it’s been so long since it came out. After Breath of the Wild, old Zeldas may prove a tad different. I think Skyward Sword was a case where I was initially easy on it because of its unique qualities, but in the grand scheme of things, I was less obligated to give it a pass for its myriad shortcomings. Indeed, after Breath of the Wild came out and proceeded to change things so dramatically, I realized if I were to play it a second time that I wouldn’t have had nearly as much tolerance for the annoying stuff Skyward Sword pulls off – a lot of which I was only barely able to put up with even back when I first played it. It’s a shame it doesn’t hold up because it is a brilliant game when it actually remembers to be one. I remember adoring some of the time sections in the desert. But I can imagine some sections have aged badly. I kind of expect that of Breath of the Wild in a decade, too. Landmark now, but it will be much copied until it could get redundant. Possibly. I’m hypothesising. I actually believe the desert to have aged the best out any of the sections; I could easily see somebody making an entire game out of the Timeshift Stones. I think Breath of the Wild has a good chance of standing the test of time because it managed to garner a lot of critical acclaim despite the 2010s being oversaturated in open-world games. Something about it caught their attention when it was so easy for them to let it fall by the wayside. We’ll just have to see how it goes. Heck, I have to complaints. Right now it’s one of my favourite games ever. While it certainly faltered elsewhere, I have fond memories of this game’s dungeons particularly the Ancient Cistern (I loved that one’s final boss which really leverages the motion controlled swordplay well) and the desert ones (with their use of Timeshift Stones, those things were just so damn cool). Great review. Have loved reading your run through of all these Zelda games. There’s no denying that the dungeon design is top-notch; while the Ancient Cistern is my favorite dungeon, I’d say the Sandship is a close second. As I said, it’s a brilliant game when you’re not being saddled with blatant annoyances. Thanks! I’m glad you’ve been enjoying these. I intend to review the remaining installments this month, so next time, I’ll be talking about A Link Between Worlds. Nice write up of a game I never played. Due to my aversion of motion controls I avoided the Wii and stylus Zeldas. Shame that the designers sabotaged Fi by making her state the obvious. You would think that Nintendo would learn their lesson after the reception Navi got. Thanks! I didn’t mind the motion controls so much, but I can see why they would be a point against the game for some. 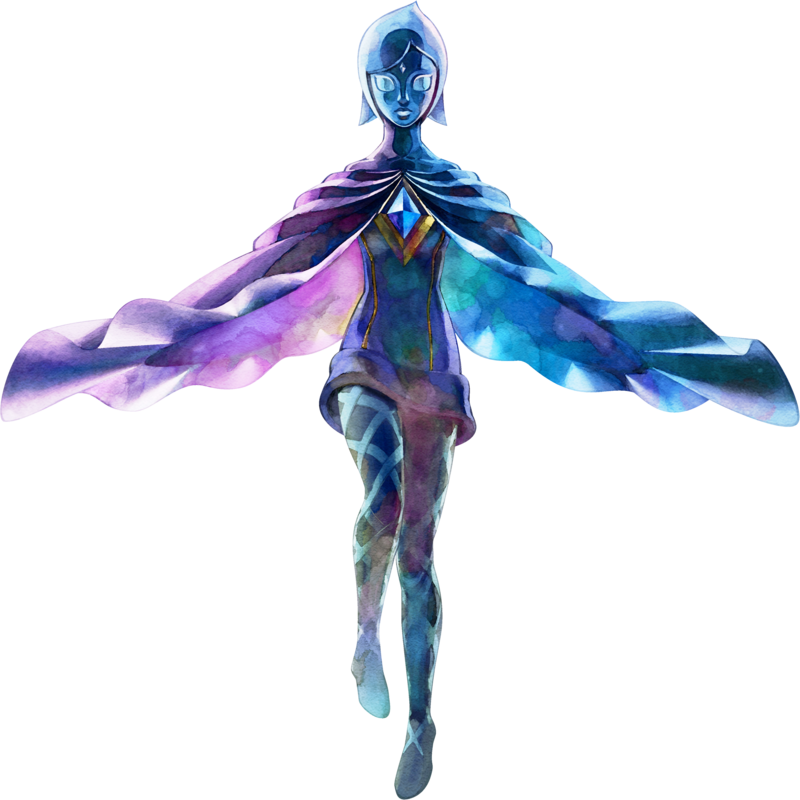 Fi’s situation is especially strange given that A) they did make Tatl, the King of Red Lions, and Midna less intrusive when they dispensed advice and B) Skyward Sword was by far the most difficult 3D Zelda game by that point in history, making the extra help odd to say the least. For what it’s worth, they did redeem themselves in that regard with the next three games – none of them have any sidekicks to point out the obvious or make you go where the plot wants you to go. You may get messages telling you to take a break, but that’s about as bad as it gets. Great review. I remember a lot of people giving this game crap when it was out in spite of the praise it got. Some derided the controls, others the visual style. I personally liked both, but then I’ve always maintained the Wii did a great job of migrating mouselook to consoles with its wiimotes. When the games were good to great anyway. Nobody should look to Anubis II as the norm. Still, there were some things I felt dragged it a bit. It seemed far more linear to me than the previous games. The new mechanics didn’t wow me, and I didn’t feel as engaged. Still, I enjoyed it overall. I think in a lot of ways it will be appreciated years from now like Wind Waker. That game started out in infamy due to the cel shaded, cutesy look to everything, and massive oceans. But years later everyone pretends it wasn’t reviled, and Toon Link is one of the most played characters in the Smash games. Not sure where I was going with that, but I digress. Wonderfully in-depth review! Thanks! I do think it gets a bit more heat than it deserves. Indeed, the level of vitriol slung towards Skyward Sword is one I’d expect for a game that’s flat-out bad. That said, I feel there are a lot of legitimate complaints to be made, and those issues really weigh down the experience. I can easily envision somebody overlooking all of those issues and appreciate what it does well because when this game is good, it’s absolutely brilliant. Then again, there’s something to be said for consistency. I don’t mind that it’s linear, but more than any other game leading up to it, it really discourages exploration – probably as a natural consequence of the overall lack of sidequests to be found. And you’re right, Anubis II is a pretty clear outlier in the Wii’s library. PC gamers like to criticize it for its shovelware because we all know there doesn’t exist a bad PC game. I clearly hallucinated my playthrough of Isle of the Dead. I am glad how coherent my review of that game turned out despite it not existing; I would never have called that. I’m glad there was someone else who was lukewarm about this game. And what a great description of Ghirahim… he was definitely one of the few villains I wanted to simply reach into the television and punch for myself. There was a lot to like in this game, and I did enjoy Groose and especially liked the arc with Impa (I’m not sure why the reveal that “Grannie” was Impa was so profound to me, but it was), and from what I know of Breath of the Wild it seems like Skyward Sword was the stepping stone to that… But that’s what it felt like: a stepping stone or an experiment for something else, much like it seems like the Wii U was an experiment before the Switch came out. A lot of writers seem to be under the impression that because the audience wants to throttle a villain, that means they’re doing something right when in reality, this isn’t true at all. 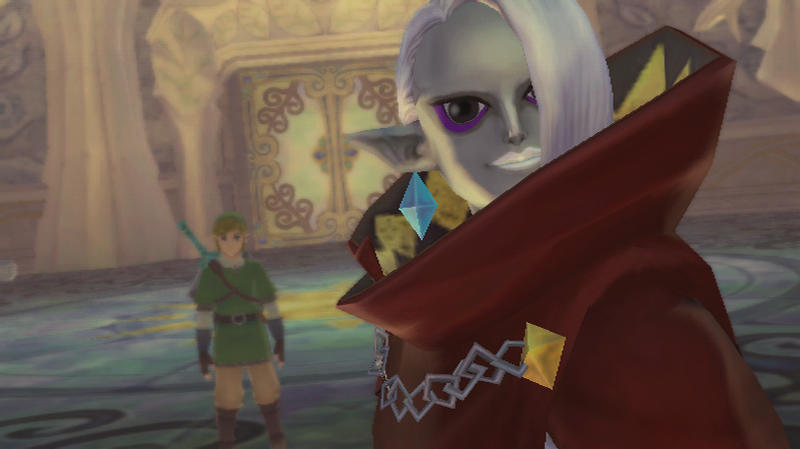 In fact, the problem with Ghirahim is that he ultimately fails at being a punchable villain. His personality is more befitting of a smug starter villain who goes down before the end of the first act. It is absolutely not befitting of a main antagonist, and putting up with his antics weighs down the experience to unbelievable degrees. I’m not saying it’s impossible; Kefka and the Joker are good examples of those kind of chaotic villains done well, but it’s easy to forget when a large portion of the fans begins quoting them incessantly that the good examples tend to be exceptions, not the rule. Most of the time, you get a flashy villain whose memetic quotes distract you from their distinct lack of substance, and that describes Ghirahim to a tee. More than anything, Ghirahim just doesn’t fit the tone of the story (or the tone of the series in general, really); every time he popped up or began speaking, it instantly took me out of the story. Either way, Ghirahim being the single worst character in the series is not a conclusion I intend to back down from any time soon. I’m not going to disagree with you! You make some very compelling points. Just to play devil’s advocate, I wonder if it was somehow a calculated move that this “opening level” villain was so stupidly annoying and pervasive through the game. He didn’t have to destroy Link, just trip him up a bit (at least as far as Demise was concerned). He was still more annoying than anything else, for sure, and when up against Ganondorf and Zant and he’s a bit of a let-down, regardless of how quotable he may or may not be. I doubt it; for all his flashiness, Ghirahim doesn’t come across as particularly smart. At best, his intelligence is eclipsed by his smugness, and his triumphs come across less as the fruits of his machinations and more the results of plot convenience. Demise needs to be revived because otherwise, there’d be no final boss to fight. Demise himself is a pretty lame villain, though he’s more bland than anything else. Roger Ebert once said that a story is only as good as it’s villain, and while I don’t agree with the sentiment, I don’t think it’s a coincidence that the weakest 3D console Zelda game also happens to have some of the weakest villains in the franchise.